There are so many things to do at the Mini Maker Faire, and what did I spend the majority of my time doing last year? 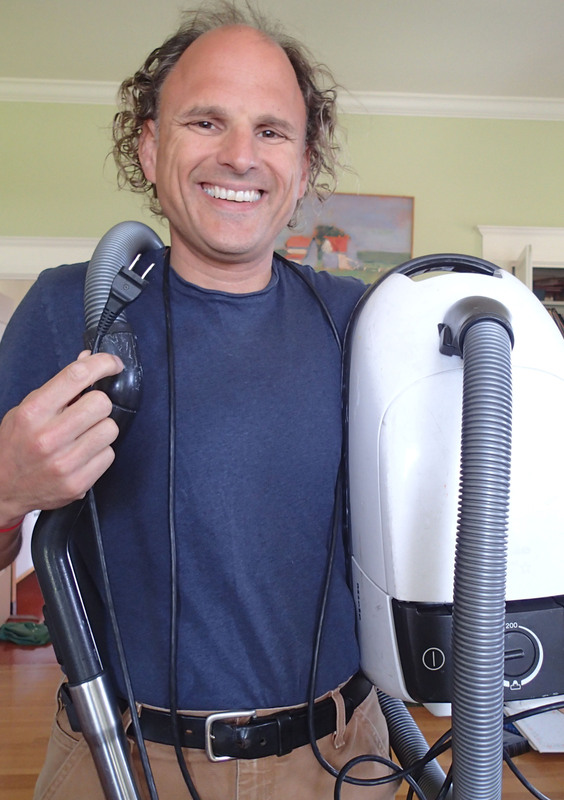 Fixing my vacuum cleaner. I don’t even know quite why I brought it over. I had heard something about a booth where you could bring stuff and have people help you fix it, and just as the faire approached our vacuum cleaner went from turning off by itself now and again to not turning on at all. I fantasized about a new Dyson. They sure do look cool in the ads. But heck, this non-responsive hunk of machinery was a Miele and just a couple years old. And it’s not like we were overusing it. This situation could be rectified. I am handy, I told myself. So, oddly enough, I found myself walking over to Mini Maker Faire, dead vacuum cleaner in hand. I navigated the crowds and made my way up to the second floor of Studio 1, where there was a whole decent-sized room dedicated to fixing people’s broken appliances and toys — the storied FixIt Clinic. I meandered in, trying to look as noncommittal as it’s possible to look while carrying around a vacuum cleaner. I avoided eye contact, looking for that special someone who would be the right match for me and my vac. Then it all started to happen. Somebody asked me if I had something to fix, and before I knew it, my machine was on the lab bench and we were discussing its symptoms. I tried to be as clear as possible, avoiding any conclusions I might have already jumped to. My helper was exceedingly nice and genuinely curious about what could be wrong. I only wish his name had not faded from my memory, a forgotten remnant of my clinic one-night stand; I remember the thrill, but not all the particulars. We laid out the various possibilities and guessed at the probability of each. Then we started investigating, the machine spilling its guts to us before long. We worked for a while, coming to various dead ends, before we were joined by Richard, another nice, funny and smart helper, who builds prosthetic robotic leg systems for paraplegics — exoskeletons, really. After overcoming our first serious mistake, where we were plugged into a non-operational power strip, the problem began to reveal itself. The power cord in this vacuum has the familiar feature where you can pull out as much of it as you need and then press a button to retract it when you are done. What this means on the inside of the machine is that the cord is wound around a big spool; and that spool is connected to a very long, coiled piece of spring steel. Also, the wire of the power cord is connected to metal plates on the spool that make contact with some springy steel on the main part of the machine. We discovered that these springy contacts were all mushed in, so that the spool could easily slide away from them and lose electrical contact. Ah-hah! We thought we were home free. Not so fast. In order to un-mush those contacts, stretching them nice and wide again, we would have to remove the spool. Unfortunately, removing the spool would give us a really good chance of causing the spool’s long, metal spring to completely unwind. But we were very handy, and there were three of us. We could get that spool out of the way without having the spring explode in our faces, slice up our hands, and completly unwind. Almost. Dang that spring was long in its unwound state. So, after expanding the springy contacts, we were faced with the daunting prospect of re-tensioning the spool’s spring, lest we end up with a vac with its cord ever-dangling with no hope of being zoomed in at the push of a button. This was no easy task. The three of us tried at it for a good while before finally succeeding. It was congratulations all around until we realized we had something on backwards or upside down, and we would have to take the spool off again. But we were not daunted! We had succeeded once, and we would again. We did. The machine powered on. The cord retracted. We closed everything up, and I headed out of there, exceedingly thankful for my helpers and thrilled that I knew so much more about the workings of this machine and that it was working again. It was such a great feeling. THE FIXIT CLINIC WILL BE BACK AT THE 3RD ANNUAL EAST BAY MINI MAKER FAIRE ON OCTOBER 14TH. It’s your turn to be handy—what’cha got to fix? 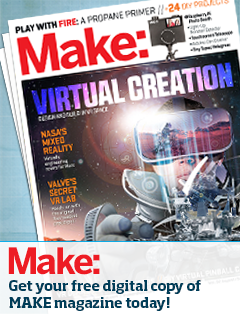 Free PDF of MAKE Magazine! Did you make a quilt block at #eastbayminimakerfaire? Each nine square block will be used to make a quilt - like this cozy one - for fire victims and foster children! Thanks @made_by_judy for sharing your post with us - and to #eastbayheritagequilters and @hellostitchstudio for their work on this wonderful project! Thanks @akiragames.us for sharing this picture of the awesome t-shirt you picked up from @slowmoonrise at #eastbayminimakerfaire! We 👏👏🏻👏🏼👏🏽👏🏾👏🏿your support of local makers! East Bay Mini Maker Faire is independently organized and operated under license from Maker Media, Inc.